Guernsey manager Steve Sharman has named an almost exclusively Guernsey FC-based squad for Sunday's Muratti with Jersey at Springfield. Belgrave Wanderers and former Green Lions forward Craig Young is the only non-Guernsey FC player in the squad. Angus Mackay misses out after failing to recover from a broken foot. Only three players - Dave Rihoy, Tom de la Mare and Simon Geall - which in March. The team also includes goalkeeper James Hamon, who has been part of the squad with League Two Exeter City this season, and Guernsey FC top-scorer Ross Allen. It will be Sharman's first Muratti in charge since as manager in September. 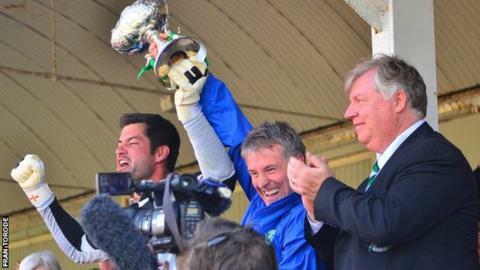 Guernsey have having not lost since Guernsey FC started playing in the English league system. Guernsey squad: Chris Tardiff, James Hamon, Nigel Hutton, Jacques Isabelle, Sam Cochrane, Jamie Dodd, Alex Le Prevost, Tom de la Mare, Kieron Mahon, Matt Loaring, Craig Young, Ross Allen, Dave Rihoy, Dominic Heaume, Simon Geall, Ryan-Zico Black, Marc McGrath, Luke Winch.